Shana Pezaro, 36, from Hove, East Sussex, was given antiretroviral drugs after fearing she may have contracted HIV. 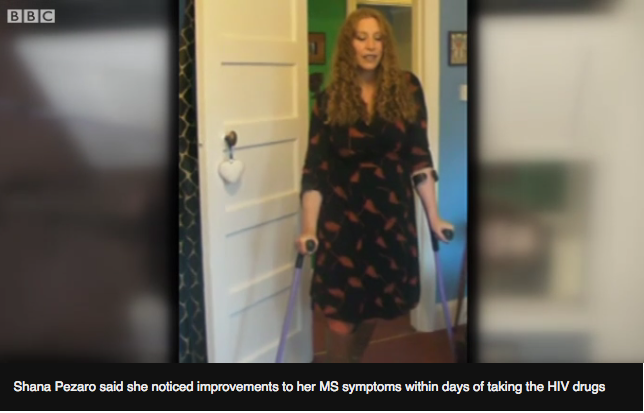 Within days, Miss Pezaro noticed an easing of her MS symptoms. When a doctor saw her walking up stairs after years of using a wheelchair he set up a clinical trial. Multiple sclerosis is an incurable condition that can lead to sight loss, pain, fatigue and disability. It affects around 100,000 people in the UK. Miss Pezaro was a dancer and piano teacher before being diagnosed with MS at the age of 28. The condition affected her hands and feet and she used a wheelchair. About a year ago, Miss Pezaro thought she may have been exposed to HIV and her doctor prescribed emergency antiretroviral drugs. "Three days after I took the drugs I walked up a flight of stairs," she said. "That was an unbelievable, massive change." Prof Julian Gold from the Prince of Wales Hospital in Sydney, saw a video of Miss Pezaro climbing the stairs and a clinical trial was set up to look at the impact of single or combination antiretroviral drugs on MS patients. An earlier study led by Dr Gold conducted with Queen Mary University, London and the University of Oxford showed an association between HIV and MS. They reported antiretroviral treatment may suppress other viruses such as those which may cause MS.
Dr Gold said: "The next stage of the investigation is to use a very similar combination [of HIV drugs] that Shana took. I think that might be quite optimistic." A spokeswoman for the MS Society said: "Our growing understanding tells us that viruses have a role to play in multiple sclerosis and it will be interesting to see the trial results - positive findings mean another step on the road to beating MS."